Pop Culture Junk Mail: Lemonade beer? A couple of summers ago I found a guilty pleasure drink, that mixes lemonade and beer and some other things I can't remember now. 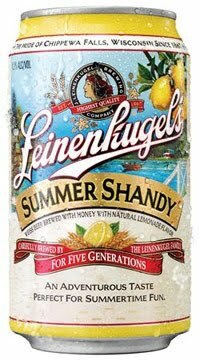 But now Leinenkuegel's has one of its own, a lemonade-beer mix called Summer Shandy. It's literally one of my favorite things about summer. You'd be remiss not to try it. I've had it. I really like it when it's super hot out and you're sitting outside. They've actually had this for awhile. It's one of their seasonal beers. It is delicious. Try it. It is awesome. I can vouch for this one, I've got a six pack in the fridge as I type. Good stuff! I don't like beer, but this is very crisp and refreshing! It smells very lemony, but doesn't taste sour. I'll have to try this! There is a brewery/restaurant near me that serves a mixture of one of their beers and their house-brewed ginger ale. It's delicious! They also have lemonade shandies. OOh! I LOVE shandies!!! Had my first one in England. But I've noticed that what we call Lemonade there is actually Sprite/7Up to us. But I will have to look for this ASAP!!! solaana said it well: Summer in a can. I love it!